I got everything together again this weekend for the system build and everything works well. Very well. I learned a couple things, too. 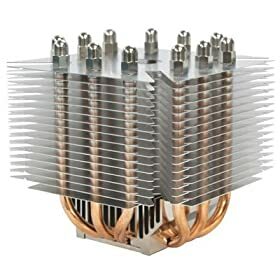 First: While the stock cooler on the Q6600 is very nice and much better than any previous cooler I have used from Intel, it is a bit small for the CPU if you ever intend to do much with it. Under full heat mode of Prime95, it reached 75C, which is not terrible, but a bit higher than I am comfortable with. So a $35 Ninja Mini is on its way to replace that. Second: $270 for a motherboard is a lot of money, but you really get what you pay for. 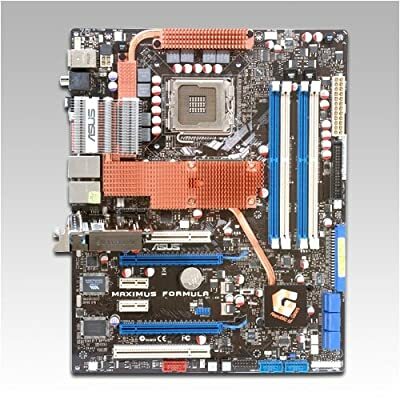 The Asus Maximus Formula is the easiest board I have ever used both for installation and configuration. I have Overclocked the Q6600 from 2.4GHz to 2.94GHz with no effort at all, simply by setting the AI settings to Q6800. Once I get the Ninja installed, I hope to push it up one more level and get 3.2GHz. The irony being that is what my Prescott runs today. I even got STALKER included in the box. I wait for the Sapphire HD3870 to be delivered later this week, then it's super gaming season for me! I can't wait to see how Stalker runs on the new rig with full dynamic lighting compared to my old system that would only run without. And you should see LAME run, it's amazing fast 20x at high quality VBR settings. That's 4 to 5 times the Prescott, and only on one core. I can't wait to see video encoding performance. Well, this is an interesting subject. I got this book as a Christmas gift and it was an easy read. If you don't know what the Darwin Awards are, you really shouldn't be on the Internet. Contained within is a collection of the latest winners. I am not going to summarize any of the entries here, you have seen many of them all over the Internet. But it was a fun read. Quick too. However, all of the entries can probably be found online, and in fact, have been promised so in the text. And it is probably more enjoyable to be fed them in small doses than all at once, anyway. I will pass this book about, so others can enjoy it, but I wouldn't rush out and buy 1-3 or any following titles. This has not been the best build I've done, procedurally anyway. On Tuesday, after finally getting the parts together and ready to go, I did the assembly. I had a wonderful experience mounting everything, although a newbie moment of forgetting to install the I/O shield before the motherboard. Oops. The motherboard has a detachable standoff for the case leads, so you just plug them into the standoff easily, then plug the standoff into the socket and you're done! Got everything installed, powered on and... nothing. No beeps, no video, but power to all components, the motherboard lights and all the fans. Another nifty feature: the motherboard itself has an on and reset button, illuminated even, right there next to the PCIe slots. Called tech support and they ask if I had the case speaker attached. Case speaker? I haven't owned a case with a speaker in a long time. Most MBs come with a little peizo buzzer just for diagnostics these days. But the Maximus line doesn't. So I had to find one. Sure enough, plugged it in, powered up, and I got the diagnostic tones for "No VGA detected". Guess my old PCI card that I was going to use for burn-in and tweaking is not going to work. And there are no local shops that I can get a cheap PCIe card. So I wait for Newegg,com to deliver a $30 x1550 for testing. This weekend it will live! Following will be a week of burn-in, OC-ing and tweaking. By February, I hope to have the HD3870 in hand and ready to game. It's been an interesting and long build. Delivery for the Beast was delayed until Monday. So no glory for me. Heavy sigh. Then on Saturday, the SCSI subsys on my server went south, knocking out the system volume. Everything is backed up, but I had to spend the weekend rebuilding. The machine is almost 10 years old, so I'm not complaining, but all of my feed builders were interrupted. I will get them re-initialized tonight, so there will only be a day or two missing from them. Sorry. Finally, after dreaming of the Core2 series of processors, I am upgrading my system. Well, I have been since August, anyway. I finally bought the CPU/MB/Memory combo this week. They should be here today! Last will be the video card. I am leaning toward the ATI HD3870 in a Saphire or Diamond Viper configuration. The case is excellent! The P182 is the finest case I have ever worked with. The walls are thick, heavy and absorb vibrations very well as they were designed to quiet the system. Rubber gromitts for drive mounts, very nice airflow and great cable management technique make this a joy to work on. I chose the Corsair PSU because of its efficiency and noise ratings. It is based on the Seasonic designs and should be very quiet. Also, my choice of size is controversial, but on metering my Prescott at full load, I never saw it cross 280Watts*. If I bought a kilowatt PSU, I would waste a lot of energy and heat from the inefficiency at the low end of usage. The Maximus Formula is an expensive drop. I did not intend to spend $270 on a motherboard. But the X38 chipset is the only one to support PCI-E 2.0 and it is supposed to be compatible with Penryn when it comes out. I don't anticipate replacing this board for a very long time. And the 2.0 spec has shown some dramatic gains for the HD3870 cards in reviews. So, ouch, but I think a good buy. The Core2Duo E6600 is considered the best over-clocker in years. It's price is $229. The Quad core Q6600 is very similar and is only $50 more. It was not a difficult decision. Memory is memory, from what I hear. I still went ahead and spent the extra $20 for 1066 for the lower latencies and OC ability. I will post more as the system specs out and I have a chance to play more. But I am very excited. Should be a fun weekend! Total spent so far (including the anticipated $200 for video): Under $1000. Great time to build PCs. *EDIT: Updated to 280 from 250. Mistake at time of post. I do not condone overriding group policies on systems in a corporate network as a general rule. The policies are setup for a reason and are there to help and protect you. No, really. However, sometimes you need to override some to get your job done or sometimes are not appropriate. For instance, I am a fervent proponent of the locked desktop. So much so that I reflexively use winkey-L when I get up from my desk. As a fail-safe, I set my screensaver duration to a ridiculously low value. Ah, but our networking folks have set group policy that is more lenient and restricted users from modifying it. So as an admin of my box, I went around the policy and set it back to more aggressive values. When I finished Thunder Below, I realized that I haven't read a Sci-Fi title in a long time and picked up a book co-authored by Ben Bova. It stunk. I didn't get more than 100 pages in and dropped it. I was afraid that since I have read a great many good books with relevance lately, that I was tainted to the irrelevant, namely fiction. I was wrong. The Time Ships is a sequel of sorts. It picks up from The Time Machine, the master work by H.G. Wells. We follow the further adventures of the Time Traveler as he attempt to return to the time of the Eloi and Morlocks. But he discovers that time streams are not linear and he cannot return to the future as returning to the past has obliterated that possible future. Instead he meets a Morlock who is civilized and vastly intelligent, far removed from the Morlocks of Wells imagining. The remainder of the story involves the Time Traveler's futile attempts to find his place in the Multiplicity, or the whole of possible past and futures. The main praise I have for this book is this: Finally someone treats time travel in a way that is not insulting to anyone who knows the least bit of theoretical physics or cosmology. I really enjoyed this book and will use it as a stepping stone to more of Baxter's works. Well done, excellently planned and brilliantly executed. A fine read. Have you ever rented a car? Did you wash it? Edit: Commenter inadvertantly reminds me that this is not a reason, but a gross simplification. I don't discount the hundreds of other reasons and historical proofs for the failure of Marxist states. Someone help me, please. I don't understand why scalpers are "evil profiteering bastards" and Ticketmaster and the venues are not. What is wrong with buying any commodity and selling it to someone else at a higher price? It works well on Wall Street, why not in entertainment. "Face Value" is a myth. The value of an object is the price you can assign that object and find a buyer for it. If I buy a comic book for $1 and sell it to you for $50, then it has a value (to me and you) of $50. If someone buys 10 tickets to Hannah Montana for $50 each and sells each one for $150 each, what is the value of those tickets? "But the scalper is not a fan, he should not be able to buy tickets." Why? Give me one rational, valid reason. The scalper is no different than any other commodity broker. He takes a risk and typically reaps reward; but only if the market will bear it. If you don't like the tactics of the scalper, fine! I don't either. Don't buy from him. But know that if you do, you validate his business model, and therefore condone his action. On the other hand, I guarantee that when it is no longer profitable, rather it becomes unprofitable, the practice WILL cease. Do not force legislation, do not cry about it. Stop supporting them, and they will go away. By the way, the people you should be angry at are the ones who paid $1000 for tickets to Hannah Montana. Shame on them.